What sort of run do you plan for March? Well the weather will be poor so make it short with an easy trip home - OK so finish near London, good plan! Thus was born the Magna Carta run on a cold November night at the Tup; a short run around London past the seats of power in the land - Church, Parliament, Monarchy, Finance and on to Runnymede where, in 1215, abuse of power by the government (King John) was curtailed by the Barons - an event since revered for having set principles against the arbitrary abuse of power by governments worldwide. Not a bad thing for us all to remember as our freedoms to ride are progressively attacked and the government is making dark threats of road pricing with accompanying ‘spy on the bike’ technology that will allow ‘them’ to record where you’ve been and how fast you went. Next it will be automatic throttle control to slow you down and then turn off your engine when your road tax credit account runs low! That GPS we all thought was such a neat piece of kit a few years ago could quickly turn into an Orwellian monster. Back to the ride - well on the day the forecast was sun and 16 Centigrade so 50 riders turned up at Warrs for a ‘winter’ ride - great turnout. With clear blue sky we set off east along the embankment, the Thames sparkling in the early sun, over to the south bank past Lambeth Palace to re-cross the river at Blackfriars bridge with fine views of St Pauls and the financial heart of the City. We turned west towards Westminster, regrouped all the bikes outside the front door of the Ministry of Defence - you are all on CCTV footage guys! Then into Whitehall past Downing Street, around parliament Square, past Buckingham Palace and north via Park Lane and the Westway to the Ace Café where trade was brisk. After a brief stop at the Ace Cafe we set off up the A40 and into Thames Valley territory, quickly out of the urban environment we crossed the Thames three more times passing Maidenhead, Eton, distant views of Windsor Castle and on to Runnymede. 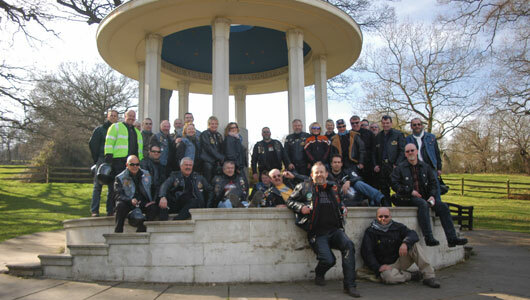 The group dismounted their bikes and 33 hardy souls struggled across the waterlogged meadow, where almost 800 years ago the Barons camped, to the Magna Carta monument for the customary group photo. Then off to the Barley Mow at Englefield Green for much needed refreshment in the garden bathed in unseasonably afternoon sunshine. Thanks to all the riders who did their bit to make the drop off system work through some demanding urban navigating.